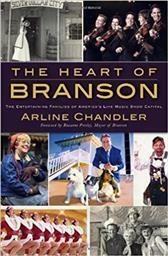 THE HEART OF BRANSON BOOK. 144 page. Millions of Americans cherish childhood memories of family trips to Branson to see performances by the Baldknobbers or the Presleys. Now they take their own children to see how new generations of those same entertaining families continue to split sides and tug heartstrings. Go backstage with Arline Chandler in places like Silver Dollar City and the Shepherd of the Hills. Reminisce in the stories of the people who made Branson into the showbiz marvel that it is today while holding on to the values of hard work and family at the town's cultural foundation. And learn about the emergence of newer acts like the Duttons the Hughes Brothers and Shoji Tabuchi in a place where Broadway and the backwoods shake hands and SIX voices is all that is needed to produce a full orchestra.